Well another year has past and it is time to let all our friends and relatives know what we’ve been up to. Here are some of the memorable highlights. In February Bryan started working at a small start-up company called Plaxo in Mountain View. He commutes about 40 minutes (each way) to work in Mountain View. Jean commutes to work in Oakland in a vanpool. She loves her vanpool. Mr. Orange stays at home and guards the house. At least we like to think he’s earning his keep. The early part of the year was pretty domestic. We had some minor work that needed to be done under the house. We replaced an inadequate sump and sump-pump under the house and spent a lot of weekends at the hardware store. Unfortunately, we aren’t very handy and there isn’t much to show for all the money spent at OSH (a nearby hardware store). In late May we took a three week trip to Japan with Bryan’s parents and Aunty Fei-Mei and Uncle Tsong-Wen.. The first part of the trip was spent touring Kyoto, Himeji, Hiroshima, Miyajima, Hakone, and Nikko. The last part of the trip was spent in Yamagata at a 7 year funeral ceremony for Bryan’s grandfather. There was also a sort of family reunion and family concert where we met many of the Takasakas (Bryan’s mom’s cousins). Aunts Kiyomi and Keiko set up a private sightseeing trip for us and we had a great time with them. 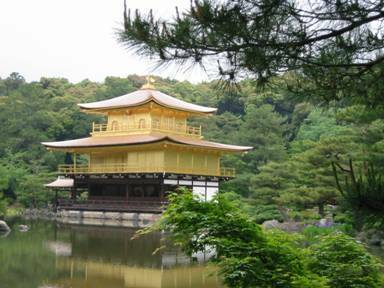 This picture shows Kinkakuji, in Kyoto. In July things got busy. We spent the 4th of July in Sacramento lighting fireworks and playing board games with our friends John and Teresa. The following weekend was spent at another Lee family reunion in Peoria, IL. The weekend was filled with lots of food and fun (bocce ball and ring toss games). Jean was much less overwhelmed this time and spent more time getting to know the relatives. The weekend after Peoria was spent in Seattle where we went to an informal wedding reception for one of Bryan’s college friends Skaff and Jaime. It was just like a corporate picnic complete with a barbecue buffet, petting zoo, blow-up obstacle courses, mini golf, and volleyball nets. Jean met many of Bryan’s college buddies and we both had gobs of fun. Later that night, Bryan played the ritual basketball game with his college buddies while Jean hung out with her family and friends in Bellevue. At the end of August we flew to Baltimore for another friend’s wedding and stayed with Bryan’s parents. The first day we visited the National Aquarium in Baltimore and the Museum of Industry. The second day we spent all day at a wonderful working museum called the Hagley Museum in Wilmington, Delaware (http://www.hagley.lib.de.us/museum.html). We highly recommend it to everyone. The third morning was spent at Ladew Topiary Gardens (http://www.ladewgardens.com/), just north of Baltimore in the morning. That afternoon was spent attending our friends Ting and P.D.’s wedding. It was a Hindu wedding and was most interesting to watch. The dinner was entirely vegetarian but very very yummy. In early October we went to Jean’s friends’ wedding in Monterey. The ceremony was on the beach and was quite scenic. There was lunch and dancing. The next day we visited the Monterey Bay Aquarium (http://www.mbayaq.org/). 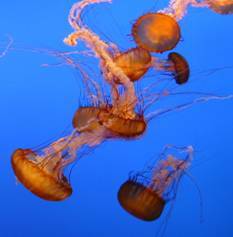 We enjoyed their impressive jellyfish exhibit. The next weekend we flew up to Bellevue, WA to see Jean’s parents and our new nephew Yoshi. He was born in late July and still didn’t have much of a personality. We are going up to visit again at the end of December to see how much he has grown. 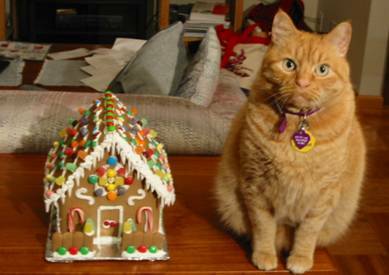 This December we went to our friend Carol’s annual Gingerbread house decorating party and had a good time. Mr. Orange appreciated our work. Later this month we are scheduled to spend Christmas with Jean’s parents in Gig Harbor WA. So that was our year. We hope yours was just as fun and exciting. As usual friends and family are welcome to stay with us if you find yourself visiting the San Francisco area. Just give us a little warning so we can clean up and make the place presentable. We enjoy hearing about what you are up to so keep in touch. If you are moving or changing phone numbers, please let us know, or if you happen to use Plaxo, the product Bryan is working on, you can update us automatically. Back to the main Bryan Lee and Jean Higaki page.